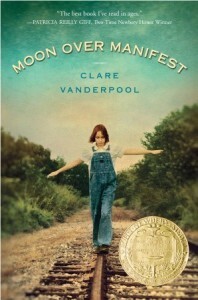 “Moon Over Manifest” (Delacorte 2010) by Clare Vanderpool won the middle-grade literature jackpot, the Newbery Award, for 2011. In 1936 Kansas, 12 year-old Abilene drops into the town of Manifest. That is, she literally drops off a freight train after years of riding the rails with her daddy Gideon. The Great Depression and the dry scorching dust bowl are both in full swing. There are two stories here. The second is set in the same town, but 1917 through 1918 when Abilene’s daddy grew up–the time of World War I and the years that the Spanish influenza killed more thousands of people than did the war itself. Rough and tumble Abilene aims to find out about her daddy’s earlier life, but it’s not easy, in spite of consulting Miss Sadie, the Hungarian “diviner”, who tells stories about and sheds insights into a huge cast of townspeople from 1917. They’re immigrants from all over Europe who worked in the coal mine and whereas it was a hard life it was a happier time for the people of Manifest. Twists and turns in this densely plotted book will surely surprise you. 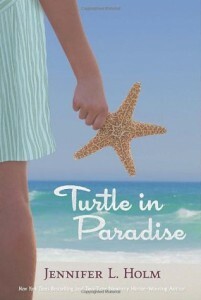 “Turtle in Paradise” (Random House 2010) by Jennifer L. Holm is the first of four Newbery Honor books and is also set during the Great Depression, but in colorful tropical Key West, Florida. The 11-year-old protagonist, similar to Abilene, is likeable, smart and hard-shelled, which is why she’s called Turtle. Similarly, she has only one parent who has sent her away, but in this case, a mother who remains in New Jersey where she earns a living as a housekeeper. Turtle is sent to her aunt’s house and must endure four pesky but industrious boy cousins who run a mobile baby-care operation called the Diaper Gang. When Turtle finds a treasure map it looks like she might end up on Easy Street. I appreciated the stream-lined plot. The Newbery Award is decided each year by a committee of fifteen hand-picked librarians. Interestingly, they must all agree on the winner, so certainly some negotiations and deal-making must ensue, but I can only guess because it is a secret process. You can bet that the pool of winners and honors will be fine books, but I would have ranked these five books differently. You’ll find out more on my blog. Both these authors used family stories–their grandparents’ stories–as the basis for their books. And each book explores the value of family. 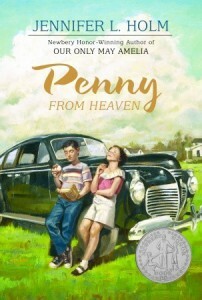 Jennifer Holm is the author of two other Newbery Honor books–“Our Only May Amelia” (Harper Collins 1999) and “Penny from Heaven” (Random House 2006). But she hasn’t won the jackpot (the Newbery Award) which would pretty much ensure that her book would remain in print forever and be in every children’s library collection, probably for the duration of book publishing and/or the existence of libraries. The jackpot winner is Clare Vanderpool debut novel, so you can hope and expect more good books to come from this author. The other three books that I’ll be reviewing in my next posts are “Heart of a Samurai” (Amulet 2010) by Margi Preus; “Dark Emperor and Other Poems of the Night” (Houghton Mifflin 2010) by Joyce Sidman; and “One Crazy Summer” (Amistad/Harper Collins 2010) by Rita Williams-Garcia. All four novels, from the group of five books are historic fiction. And the two yet to be reviewed are FABULOUS. I think you all should read them or the ones that sound interesting and then we’ll rank them the way we see fit. Deal? Thanks for reading. Please comment. It’s easy to subscribe and get a notice about these posts once every three weeks. Great idea, Patricia. I’ve only read two of the Newbery books for this year (Moon & Crazy) but I will try to get to all of them soon. I read Holm’s “Amelia” book way-back-when but it wasn’t my cup of tea. (Nice tea party, by the way!) I looked for your blog but am confused. Is it in addition to the reviews or part of them? Thanks for getting back to me about a review copy of my book. Hope you’ll find it in your library one of these days. My quick thoughts on Moon Over Manifest. I love the title and there’s a lot of good writing in the book. But “densely plotted” is a positive spin on a book that needed (in my opinion!) a much stronger editorial hand. Sheila, I totally agree with you about the plotting of “Moon Over Manifest”. I felt that whenever the author needed a new thread for her plot, she began it at the moment of need, rather than starting it much earlier on and letting it weave in naturally. That’s a bit of a cheat. In that regard, “Turtle in Paradise” was well-plotted. And better for a younger reader than Manifest. About Jennifer Holm, having won 3 Newbery Honors but not the jackpot Winner–as my father used to say about entering his plays in contests and frequently getting runner-up but not the jackpot–“always the bridesmaid, never the bride”. It’s great to get an “Honor” but it’s the winner that will be on every library shelf as long as books are printed. I look forward to reading your book. Thanks for commenting. But there are exceptions! Charlotte’s Web was a Newbery Honor book in 1953. I have no idea what book won that year. And even books that never won anything can be winners to the kids who read and love them. How interesting that your father writes plays. Are any of them being performed? Have you read Sue Miller’s novel, The Lake Shore Limited? It’s a well written book with a playwright as one of the main characters. I’m so glad you mentioned “Charlotte’s Web,” as a Newbery Honor, Sheila. As I said, the entire Newbery committee must agree on the winner so negotiations and deal-making surely must take place. And as a result, the honor books are FREQUENTLY better books than the winner, in my opinion. So, E.B. White won the honor for Charlotte in 1953 when “Secret of the Andes” won the jackpot. I’ll check it out and read Secret of the Andes, which I’ve never read. The library has it, of course. And thankfully, it has Charlotte’s Web. Some books are so great they find their way to the top regardless of the Newbery vote. And just as important: was “Midwife…” a better book than the honor books in 1996: “What Jamie Saw” (Carolyn Coman) or “The Watson’s Go to Birmingham” (Christopher Paul Curtis)? And then in 2000, Christopher Paul Curtis wins with “Bud Not Buddy” which is nowhere near the book that “The Watson’s go to Birmingham” is (in my opinion). So, my thought is, the pool of winners and honors are good books, but the order of their ranking, I’m guessing, is political in many cases. So read them all and decide which you would choose as the winner. P.S. My father, Norbert J. Hruby, was a prolific writer in his retirement. “The Kris Boys” is his most performed play (including a wonderful production at the Chicago Cultural Center some years back). His plays are archived at Aquinas College in Grand Rapids, Michigan, where he was president of the college from about 1968 to 1984. I have often had very similar thoughts about this award and the honor books. You mentioned ranking. Are you talking about an order in the honor books? I thought each honor book had equal footing. Of course, we can rank them ourselves although it won’t be easy, I’m sure. That is so interesting about your father’s work. I love going to see plays, but I am not very good at reading them. I guess I need the actors to bring the characters to life. Leone Anderson’s son and daughter-in-law are both actors who live near Chicago. I admire the whole performance world — playwrights, actors, and storytellers. I read SECRET OF THE ANDES which won the Newbery in 1953, the year CHARLOTTE’S WEB won an honor. SECRET OF THE ANDES is wonderful–beautifully written and about a people who are vanished or nearly so. So I imagine that the Newbery Committee took that into account and found the book “important.” It’s really worth reading.